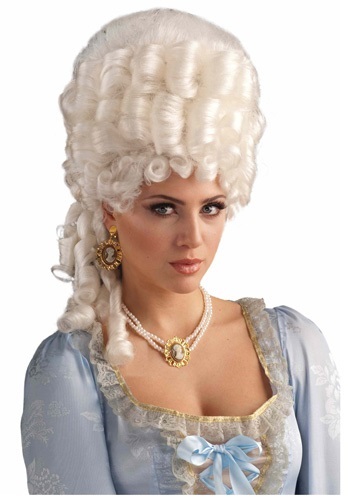 If you want your hair to be styled into the perfect bouffant and ringlets for your Marie Antoinette costume you could either A) Spend hours watching instructional videos on styling hair and invest many dollars on professional styling products or B) Get this wig. We recommend the wig. Because it's designed to look perfect right out of the package so you can move on to other things, like explaining that whole 'let them eat cake' comment. You were only kidding, right? 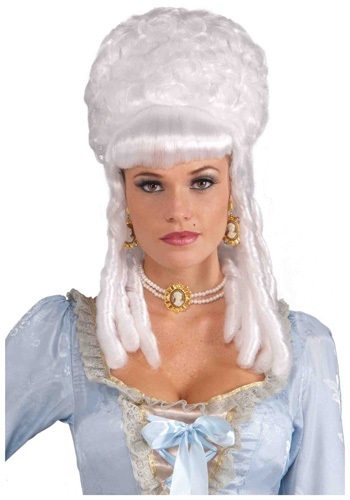 Start a fashion revolution once you're in this Basic Marie Antoinette Wig. No one will blame you for wanting to go against the social norm. It's apart of life, even in the 1700s. You're little princess is on her way to setting the worlds largest fashion trend. Or inciting a rebellion against the throne. 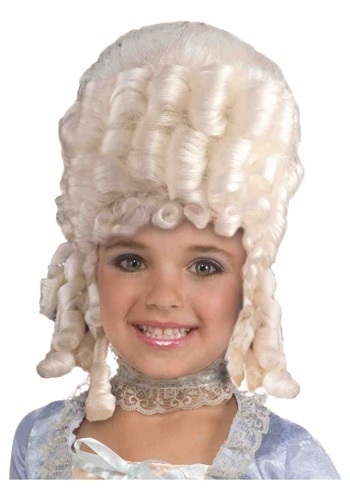 Either way, she'll be ready for her big debut in this Child Marie Antoinette Wig. It's the perfect way to accessorize her costume! If Vogue existed in the 1770s, Marie Antoinette would probably be the editor. Sure she helped incite a rebellion that completely turned French aristocracy on its head, but you can't deny that the woman could dress! That just goes to show you that it pays to be different from the rest. Our motto is "let 'em all eat cake!" Because you know, who doesn't love cake? Then someone told us that Marie Antoinette said that first and it caused an uproar. If she did indeed say that then she was a pretty smart lady! Again, who doesn't love cake? 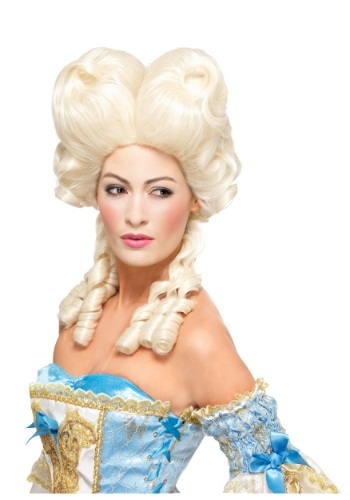 So get out there and devour as much cake as you please, but do it in our Deluxe Marie Antoinette Wig. Be dark and mysterious this Halloween in this Masquerade Ball Costume! You can be a Gothic princess or Queen Victoria in mourning in this regal gown. After her beloved husband, Prince Albert, died in 1861, Victoria wore black clothing for the rest of her life. This dress evokes fashions of the late 19th century. And did you know that some of today's Gothic fascination with dark themes has its roots in 19th century Gothic literature? NOTE: the brooch shown in the photo is not included. Traditionally aristocracy is not something one can just ascend to. You have to be born into the right family, and spend most of your life refining your tendencies towards having only the most elite of tastes. That is, until this costume came along.... Now you can just outfit yourself in style and blend in with your new high class friends seamlessly. As long as you brush up your vocabulary a little bit you'll be just fine! Giacomo Casanova (yes, he was a real person) charmed ladies everywhere he went. Their fathers, husbands and brothers, not so much. He did have a hooked nose, just like this Shiny White Casanova Mask. 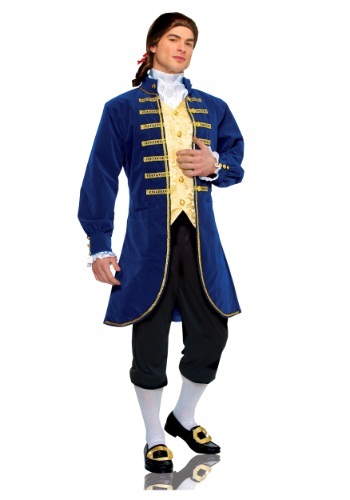 If you want to become this notorious adventurer, practice your best pickup lines and choose a colonial-style costume. (Though Casanova never visited America, he lived in the era of the American Revolution.) If you want a couples idea, choose a Marie Antoinette costume for your lady (Casanova spent time at the court of Versailles). Are you ready for a royal rendezvous? You sure look like it! Make all the King's men swoon when you wear this Womens Pink Marie Antoinette Costume. Marie Antoinette wasn't known for being nice, but she sure knew how to dress. This beautiful pink and gold brocade dress will make you the most scandalous woman in the Palace of Versailles...as if you weren't already! Now, is it time for cake, yet?